Immortalize your magic moment forever. Book a wedding proposal photographer! What great news! You decided to propose to the love of your life! It's a beautiful moment you can capture forever with romantic and professional photographs. Minimum of 35 digital photos. This package is the right one if you think that after the YES you want to spend some time (around 30 minutes) with the photographer and then enjoy the rest of your time only with your loved one. Minimum of 50 digital photos. This package is the right one if you think that after the YES you want to spend some time with the photographer (around 60 minutes) and take pictures at least in 2 different locations. For example, the photographer could shoot the toast that you might do in a nearby bar or cafe. Minimum of 65 digital photos. This package is the right one if you think that after the YES you want to spend a longer time with the proposal photographer (around 90 minutes) and take pictures at least in 3 different locations. The photographer could shoot your dinner by candlelight. The proposal photographer will be hidden at the time of the proposal. You will have a personal Skype call with a Pix Proposal specialist as soon as you book the shooting. 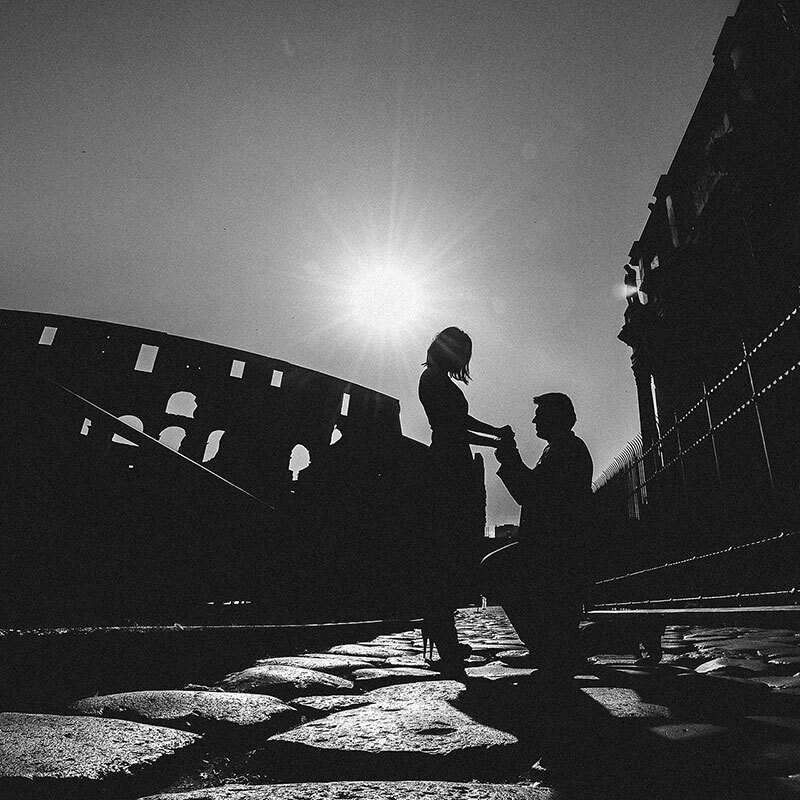 We will give you all our support in order to create a special scenario and we will suggest the best spot for your proposal depending on the city chosen for this special moment. You will receive a map with the exact spot where to stand in order to have the best shot. 1	BEFORE THE PROPOSAL: The selected photographer will be ready to take pictures 10 minutes prior to your arrival. He/she will be hidden from the eyes of your loved one. 2	THE TWO OF YOU: The photographer will start to take pictures from the moment you arrive and will capture the moment of the proposal. 3	THE HAPPY ENDING: After the"YES" he/she will stand with you to capture your happiness and create a perfect photo album engagement. In 5 days, you will receive the email with the link to download the photos. The photographer is present in the moment of the proposal. You will have a personal skype call with a Pix Proposal specialist as soon as you book the shoot. We will give you all our support in order to create a special scenario and we will suggest the best spot for your proposal depending on the city chosen for this special moment. 1	BEFORE THE PROPOSAL: Book the proposal package you prefer and tell your loved one that you bought a “normal” photo shooting (it is only a white lie). In this way your partner will know that a photographer will take some pictures of you during your vacation. 2	THE TWO OF YOU: During the photo shoot (in the place / time previously established with the Pix Around proposal specialist), you propose and the photographer will capture you and your partner's your love, happiness and joy. 3	THE HAPPY ENDING: After the "Yes", the proposal photographer remains with you to create a perfect photo album of the engagement. In 5 days, you will receive the email with the link to download the photos. Questions, specific requests? Leave a message here.